It begins February 17, 2018 and ends on June 17, 2018. Funds will help to provide unlimited noncompetitive dance scholarships for youth, removing economic limitations or barriers and providing dance accessibility for ALL youth in our community. This creates dance possibilities for 100s of families in Keshet’s community and pre-professional education programs each per year. How much has been raised so far and what is the funding goal? WOO – HOO! You did it! Why should I GIVE to this fund and SHARE with friends and family? 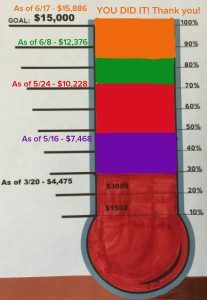 with your family and friends this link – https://keshetarts.org/donate-to-scholarships, so they can GIVE and SHARE on their social networks. Together we can enrich our community through dance!